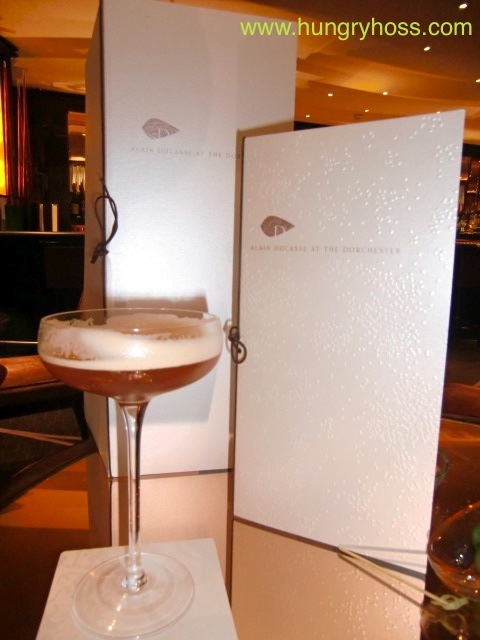 To quote the lyrics made famous by Andy Williams, “It’s the most wonderful time of the year!” And, although I ate at Alain Ducasse in June 2010, it’s the Christmas season (as well as the three Michelin stars) that I credit for bringing me to the The Dorchester. After travelling across Blackheath and down through Greenwich Park (hopefully swathed in snow), we would cross the river via the Rotherhithe Tunnel. Our first stop would be at Tubby Isaac’s Seafood Stall for some jellied eels, whelks or, my favourite, winkles - then, onto Beigel Bake in Brick Lane for salt beef beigels and a dozen plain bagels for in the morning. Full of food and festive cheer, the singsong would resume until our arrival at Oxford Street, where our tuneful merry making would be replaced with “Oohh”s and “Aah”s aplenty! The lights there have been a regular source of good cheer since 1959 (although, due to recession the lights were switched off between 1966 and ’78 – it’s heartening to know things have not quite become that desperate again). Over the years, the lights have been switched on by various luminaries: including the Knights Bachelors: Sir Bob Geldof, Sir Terry Wogan, Sir Cliff Richard, Sir Richard Branson and Sir Steve Redgrave - this year The Saturdays did the honours. Taking a left at Oxford Circus, we would head down Regent Street towards the bright lights and bustle of Piccadilly. Each year, much to my amusement (and my mother’s annoyance), my dad would throw his hands up, roll his eyes and proclaim, ‘It’s like Piccadilly Circus round here!” Nowadays, much to my amusement (and my wife’s annoyance), I too repeat this joke whenever we are passing through. The Regent Street Association started the custom of putting up decorations for festive season in 1948 – a year after the first Norway Spruce tree was provided for Trafalgar Square, as a thank you for support during World War II, by the people of Oslo. Decorated each year with hundreds of heavenly white lights, as a child it never failed to fill me with a sense of awe and wonder. The next leg of the journey took us along The Mall to Buckingham Palace to see if The Queen was at home (Royal Standard = Queen in / The Union Flag = Queen’s popped out). We didn’t like to stop for a mince pie or Dubonnet and Gin, as she would have probably been busy preparing her speech. Heading up Park Lane, before finally looping back along Oxford Street for a final look at the lights, the next building to wow me as a child was the imposing art deco edifice of, what was designed as ‘the perfect hotel’, The Dorchester. Since passing the hotel from a young age, I always dreamed of one day staying there. 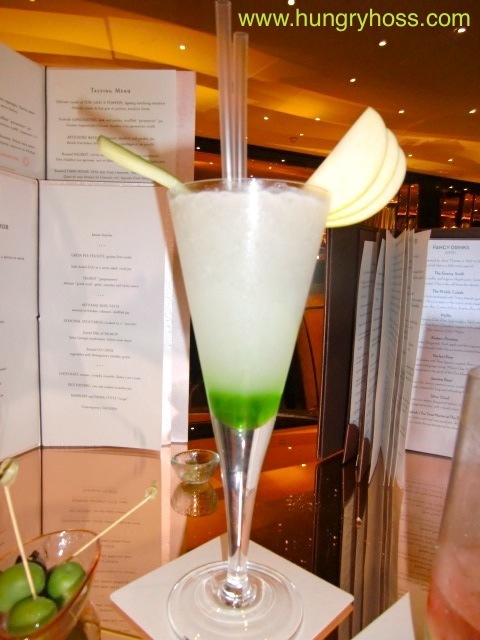 As a young man I worked at the Saudi Arabian Embassy, just around the corner, on Curzon Street; I would often walk up to Hyde Park on my lunch hour and the desire to visit the hotel never diminished. 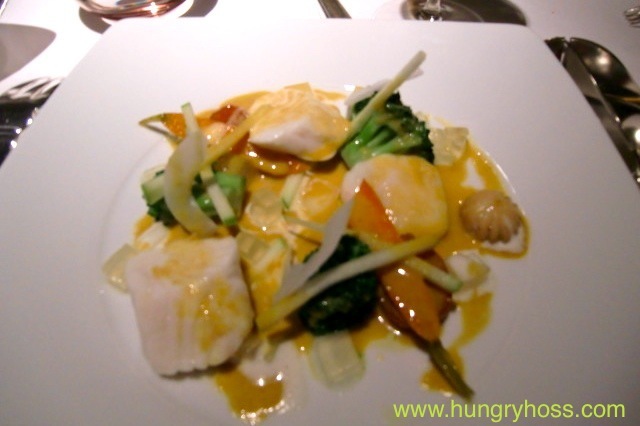 So it came to pass, when we were planning our foodie trip to London in 2010 and fancied dining in one of the city’s two, three starred restaurants it was Alain Ducasse at The Dorchester that won over Restaurant Gordon Ramsay at Royal Hospital Road. 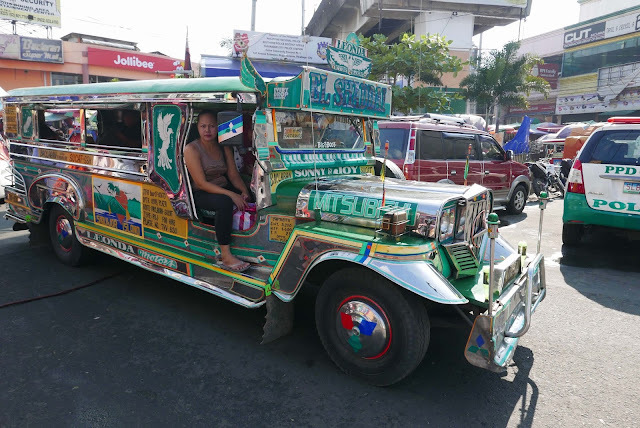 With three Michelin Stars promising ‘exceptional cuisine, worth a special journey’ I arranged for a limousine to take us to the restaurant – if we were not making a ‘special journey’ we could at least make it one by arriving in a swanky way. Pulling up outside The Dorchester to be greeted by the famous top-hatted hotel porters looking dapper in their famous green uniforms, certainly made us feel regal. 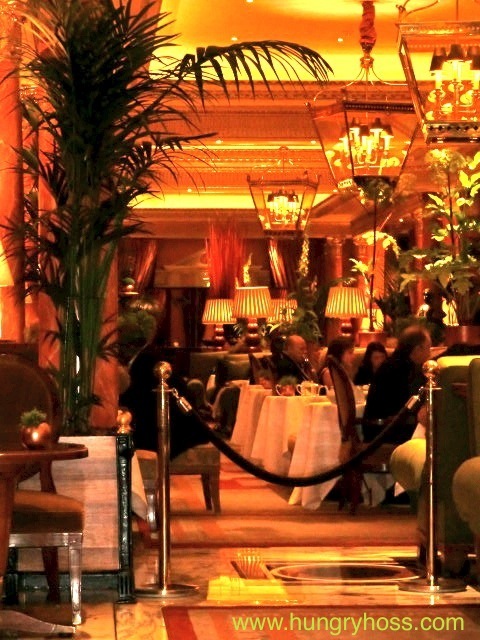 Upon entry through the revolving doors we were overwhelmed with the luxury of The Promenade, one of London’s premier venues for Afternoon Tea. Later in the year we were lucky enough to stay in New York’s Waldorf=Astoria; both hotels opened in 1931 and have many similarities, such as grand pianos in their lobby. Of course the Waldorf’s Steinway once belonged to long term resident Cole Porter. Generally though, the American hotel may be larger with somewhere in the region of six times as many rooms and over double the number of floors, but for me, the London hotel has a uniquely British grandeur, splendor and magnificence that cannot be beaten. 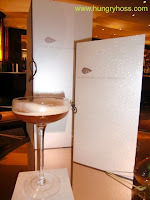 We had arrived early with the intention of enjoying some pre dinner cocktails in The Bar at The Dorchester. I’m not usually a fan of cocktails but my stepson, Joel Fraser, is an Internationally renowned mixologist. Having worked at Melbourne’s Der Raum (The World’s No.1 Bar) and Singapore’s The Tippling Club he know runs The Cufflink Club (click here) an event mixology and bar consultancy company in South East Asia, so I thought he’d appreciate some pictures and a copy of the menu which the barman kindly provided. As expected, the high ceilinged, oak paneled dining room proved to be a truly magnificent space. At the centre of the dining room the ‘Table Lumière’, encircled by fibre optic strands, acted as the main focal point. The surrounding tables were elegantly presented with the finest linens, tableware and individual porcelain sculptures – ours was a bunch of garlic. The chairs were comfortable in soft beige leather. Service throughout the meal was excellent. 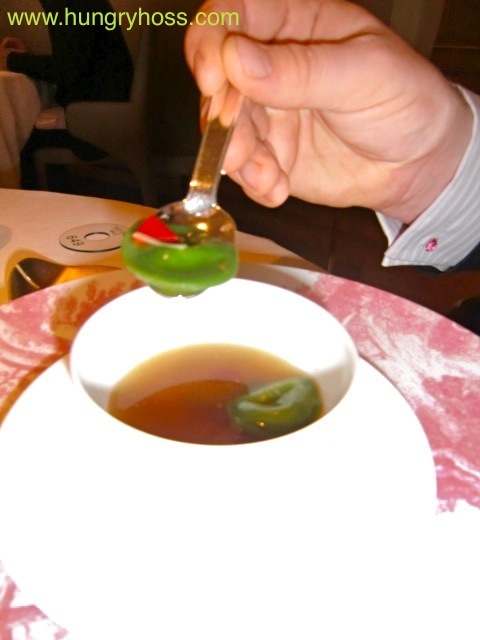 Our meal started with an ornate dish piled high with Alain Ducasse’s famous Gougères. The recipe for these is readily available online and they have regularly featured at subsequent dinner parties of mine - always going down a storm. 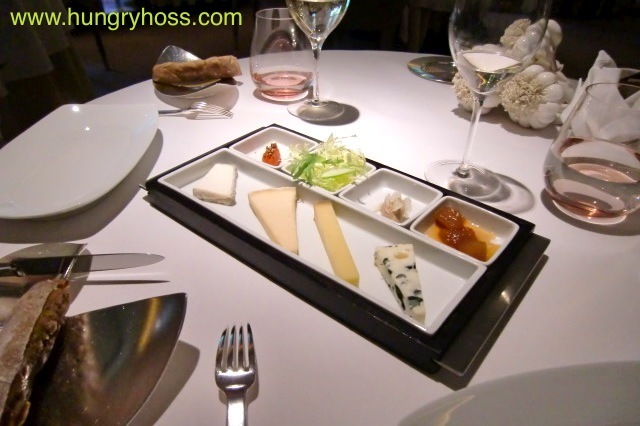 Due to the fact that I started this blog almost a year after visiting Alain Ducasse, I only took a few photos for posterity and did obviously not make any notes about the food. As a result, there are parts of the meal that I do not have a pictures for (such as the wonderful breads that did not stop coming – pleasingly served with a salty butter, the kind with crystals in) Similarly there are some dishes which I cannot recall all the details. Suffice to say, at the time we found the food to be excellent. My starter was agreeably spiced John Dory Gougonettes (although it could’ve been Halibut) – the broccoli and carrots were cooked perfectly al dente apple matchsticks; tropical notes came from the shards of coconut and cube of jelly and the curried sauce was lifted with the sweetness from neat matchsticks of apple. 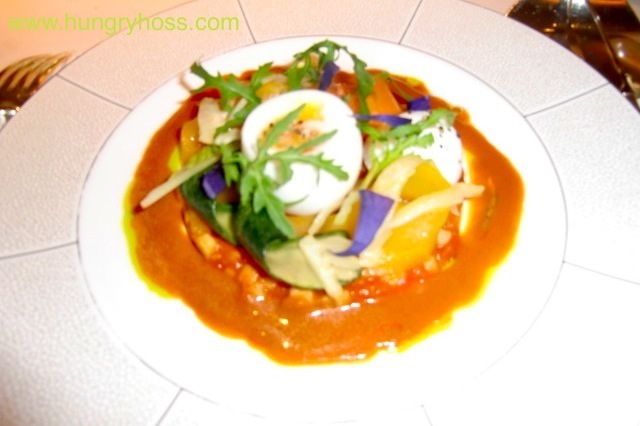 I fail to recall what my wife’s starter was called or how it tasted but it was another fine example of classic French cookery – the egg on top was cooked to perfection. 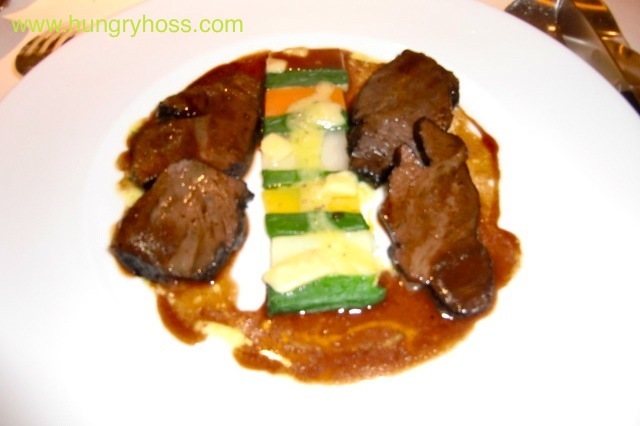 Simply, yet elegantly served, my main of Ox Cheek with Vegetables was delightful. 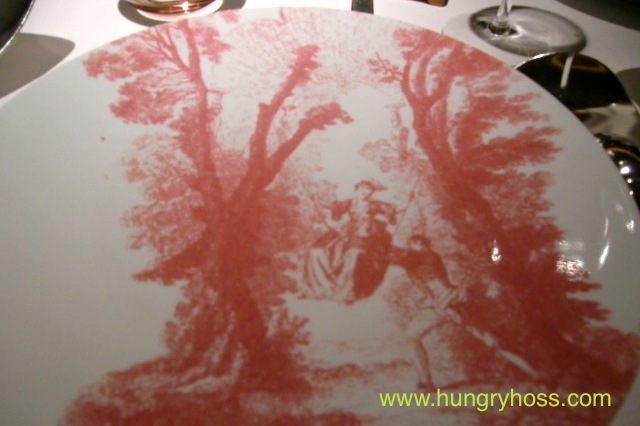 Although I recall not being wowed by the presentation (from a three star establishment I expected something more ornate, artistic and precise), I had to remind myself that I came to Alain Ducasse for flawless classical French cookery – and that’s exactly what we got. Some ‘fine dining’ restaurants these days serve food that I like to call ‘all fur coat and no knickers’ where it looks the part but lacks basics – i.e. flavour. 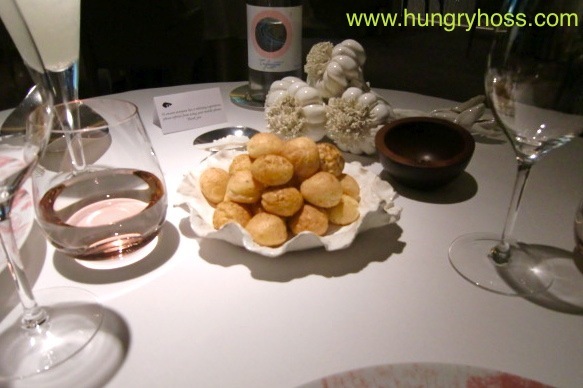 The food we were served at Alain Ducasse may not have had the ‘fur coat’ but it had good, solid knickers – the kind your Granny used to knit. My wife’s main was a farfalle pasta dish – or ‘action man bow ties’ as Alan Partridge calls them. Before the desserts, we were served a cheese course. As tasty as the cheeses were with their paired condiments, I do prefer to make my own selection from a trolley, as it’s a great way to learn about the cheese. 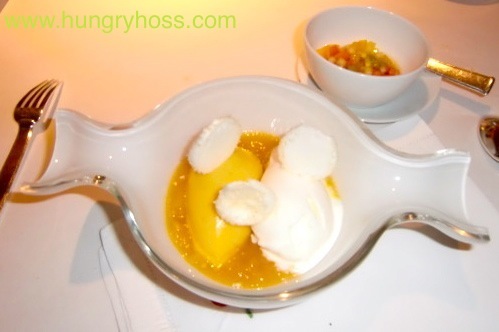 Served in a funky glass bowl shaped like a sweetie, my chosen dessert was a Contemporary Vacherin made with exotic fruits. Not to be confused with the cheese of the same name, a traditional vacherin dessert consists of rings of meringue filled with fresh fruits and a Chantilly cream and is named due to its whiteness and similar circular appearance to its cheesy namesake. 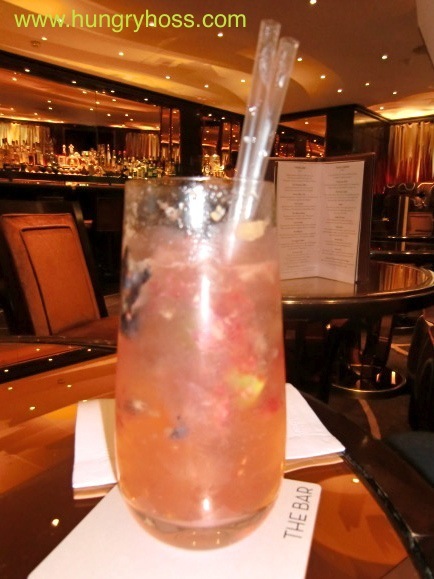 This version with its accompanying dice of tropical fruits was a triumph, with the passion fruit leading the charge. As you can see in the picture, my wife was very pleased with her choice of dessert – although memory fails us as to exactly what it was. We finished the meal with some tea and a stunningly delicious array of petit fours. I opted for my favourite green tea. A nice touch was the availability of a ‘tea sommelier’ (not an official title) who had a trolley of honey and fresh herbs and plants for those wishing to have a freshly made tisane or infusion. 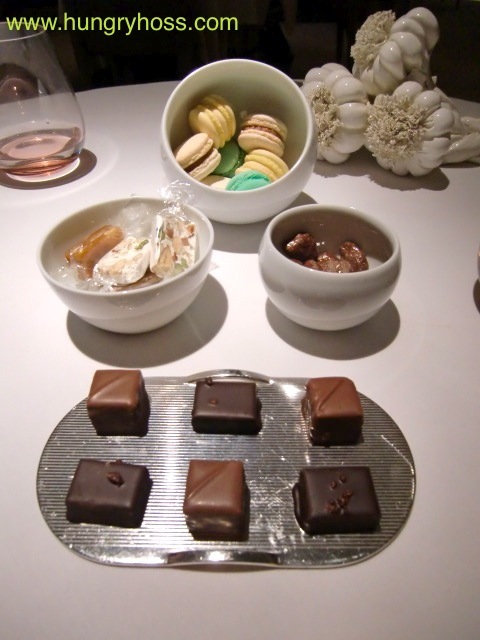 The petit fours included macarons, chocolates, pralines, nougat and assorted caramels. My wife raved about the salted caramel but it was the passion fruit one that won the day for me. The lemon, mint and milk chocolate macarons were up there with the best I have tasted. Thanks for sharing this. 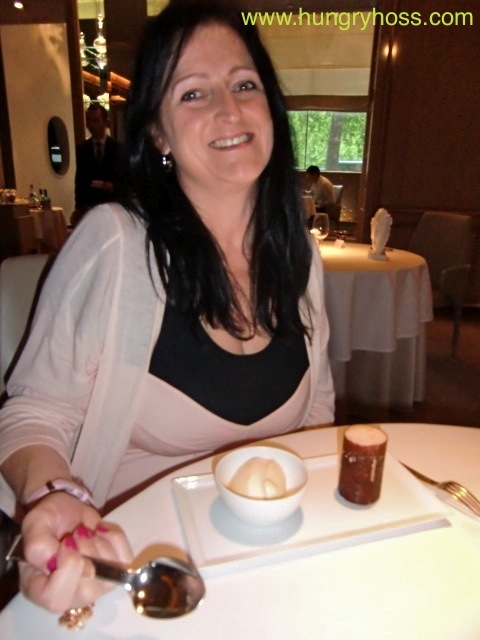 I had the last night of my honeymoon at The Dorchester and ate at Alain Ducasse, and it's the best meal (as an overall experience, anyway) that I've ever had. Always happy to see someone else enjoy their time there. You definitely need to get a room one day. Breakfast in The Promenade is wonderful. 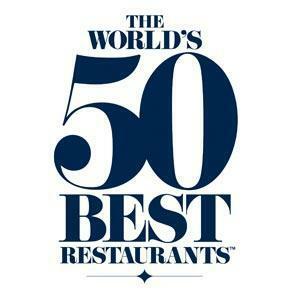 You are lucky getting to eat at so many wonderful places! This looks absolutely marvellous. 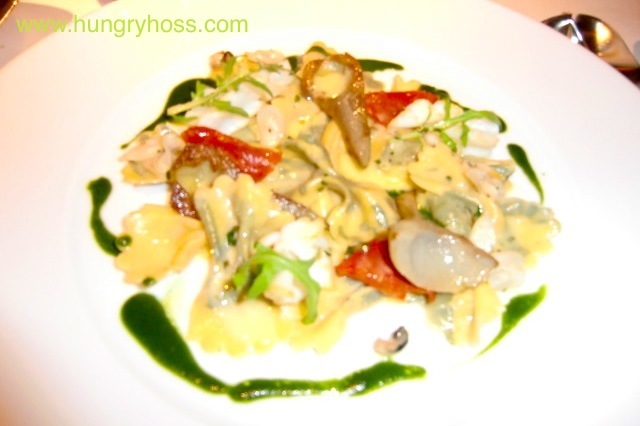 I also enjoyed reading your review of the jules Verne restaurant!